Brise Soleil Systems is a lightweight solar shading system designed to reduce solar glare and therefore over heating within the building. The option of vertical or horizontal application is also available depending on the design requirements. It is a simple system to install and designed to suit most architectural requirements. Brise Soleil Systems offers designers a versatile and practical solution to managing solar radiation, designed with fast and practical installation in mind it offers main contractors a highly cost effective solution. Metal Technology’s System 22 Brise Soleil System has been designed as a lightweight solar shading system to suit most architectural requirements. Metal Technology’s Brise Soleil System is a simple system to install and is designed to reduce solar glare and therefore overheating within the building. 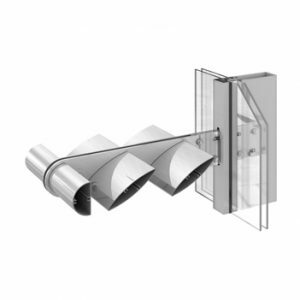 Aerofoil blades placed between outriggers can be attached back to Metal Technology’s Curtain Walling or the structure of the building itself. Mounted in front of the building the blades can provide a continuous shade around corners and curves. This, combined with the various angles at which the system can be installed, ensures that the shade created is of maximum benefit. The option of vertical or horizontal application is also available depending on the design requirements. With a choice of both 150mm and 200mm pitched aerofoil blades it offers designers a versatile and practical solution to managing solar radiation, whilst adding a modern architectural aesthetic. Designed with fast and practical installation in mind it offers main contractors a highly cost effective solution. Metal Technology can design various other profiles which can be incorporated allowing architects to achieve flexible designs. In line with our Environmental Policy this manual is not currently being released in paper form – please go to www.metaltechnology.com to view and download the technical fabrication literature and AutoCAD drawings for this system. As System 22, Brise Soleil Systems, is not currently covered by the LogiKal estimating package, should you require any help with material take-offs, please forward details to Metal Technology’s Estimating Department.